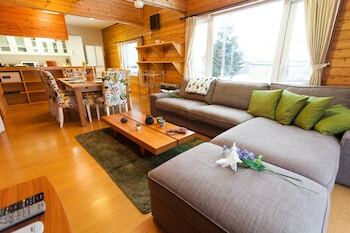 With a stay at this cottage in Kutchan, you'll be within a 15-minute drive of Niseko Mountain Resort Grand Hirafu and Lake Hangetsu Nature Park. Featured amenities include multilingual staff and luggage storage. A train station pick-up service is provided at no charge, and free self parking is available onsite. With a stay at this guesthouse in Kyoto, you'll be within a 10-minute drive of Toji Temple and Higashi Honganji Temple. With a stay at Tomiya Ryokan in Kyoto (Shimogyo), you'll be minutes from Kyoto Tower and Higashi Honganji Temple. Featured amenities include a computer station and an elevator (lift). Located in Kutchan, Holiday Niseko Flow Niseko is within a 15-minute drive of Niseko Mountain Resort Grand Hirafu and Lake Hangetsu Nature Park. Free self parking is available onsite. Located in Nakafurano, Pension Raclette is within a 15-minute drive of Farm Tomita and Lavender East. The front desk is staffed during limited hours. Free self parking is available onsite. With a stay at this apartment in Fukuoka (Hakata-ku), you'll be within a 10-minute drive of Tochoji Temple and Fukuoka Art Museum.